A man shouted "This is for Britain" as he killed Labour MP Jo Cox, the Old Bailey has heard. She was stabbed 15 times and shot three times outside her constituency surgery in Birstall, near Leeds, on 16 June - a week before the EU referendum. 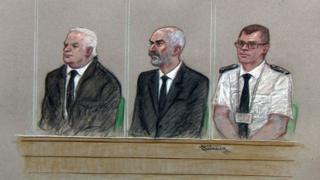 Jurors were told Thomas Mair, 53, killed the mother-of-two for "political and/or ideological reasons", and had researched "far right" material in the weeks beforehand. Mr Mair, from Birstall, denies murder. Mrs Cox, 41, had supported the Remain side during the EU campaign, and was due to hold a constituency surgery in a library after visiting a local school and care home when she was attacked. Mr Mair told police officers "I am a political activist" when he was arrested less than a mile from the murder scene, the court heard. Prosecutor Richard Whittam QC said: "Thomas Mair clearly held views that provided him with a motive - utterly misplaced of course. "The prosecution suggests that motive was such that he killed her because she was an MP who did not share his views." It was as Mrs Cox arrived for her constituency surgery that Mr Mair approached her from behind and stabbed her before shooting her, the court heard. Fazila Aswat, the MP's manager, allegedly heard the defendant shouting, "This is for Britain. Britain will always come first," the prosecution told the jury. Items found at Mr Mair's home showed he had "strong political and ideological interests", Mr Whittam said. The court heard the accused had used computers to look up websites at the same library where Mrs Cox was due to hold her surgery. In May, he had accessed the Wikipedia page of an online publication called the Occidental Observer - a "far-right" publication "that covers politics and society from a white nationalist and anti-Semitic perspective", the prosecutor said. Jurors were told that in the days leading up to the killing that Mr Mair also looked at Twitter and Wikipedia pages for Mrs Cox and went on to view information on former Foreign Secretary William Hague. And he viewed websites on Nazi material, the death penalty in Japan, political prisoners and the human liver and spinal column. On the eve of the attack, say prosecutors, Mr Mair researched right-wing politicians, as well as the Ku Klux Klan and civil rights activists killed by its supporters. The court heard Mr Mair was arrested following the attack and told officers he had a knife and gun in a black holdall he was carrying. Jurors were shown photographs of a German-made .22 Weihrauch bolt-action weapon and were told Mrs Cox's blood was found on the barrel during forensic examination. Mr Whittam told the court a knife found in Mr Mair's backpack also had blood on the handle which contained "a major DNA profile matching that of Jo Cox and a minor DNA profile of the defendant". Mrs Cox was shot three times, once in the chest and twice in the head, and stabbed 15 times including in the heart and lungs. She had wounds to her hands showing she raised them to try to defend herself, the court heard. Jo Cox was a self-proclaimed "proud Yorkshire lass" whose work for charity took her around the world and whose political success led her to Westminster. The 41-year-old mother-of-two was elected as MP for Batley and Spen in the 2015 election and increased Labour's majority to 6,051 (from 4,406 in the 2010 election). She described herself as "proud and humbled" to be the Labour MP for the place where she was born. Mrs Cox first worked in politics after graduating from Cambridge University in 1995, but then built a career working for charities including Oxfam, Save the Children and the NSPCC. She was described by Labour leader Jeremy Corbyn as "a much loved colleague, a real talent and a dedicated campaigner for justice and peace." Jurors were shown CCTV footage of the defendant making his way along the road after leaving his home on the morning of the killing. The court heard Mrs Cox arrived for her surgery with her manager Ms Aswat and senior caseworker Sandra Major at 12:50 BST. The prosecution claimed that Mr Mair attacked the Labour MP two minutes later in what it described as a "dynamic, fast-moving and shocking incident". Jurors were told that passer-by Shelly Morris reported hearing "a loud bang like a popping sound" and a "loud piercing scream". She said she saw a man with a large steak knife with a jagged blade which he wielded in a "stabbing motion". Jurors were told that 77-year-old Bernard Carter-Kenny was also injured as he tried to save Mrs Cox. Mr Mair denies murder, grievous bodily harm with intent, possession of a firearm with intent to commit an indictable offence and possession of an offensive weapon - a dagger. The trial continues, and is expected to last for up to three weeks.